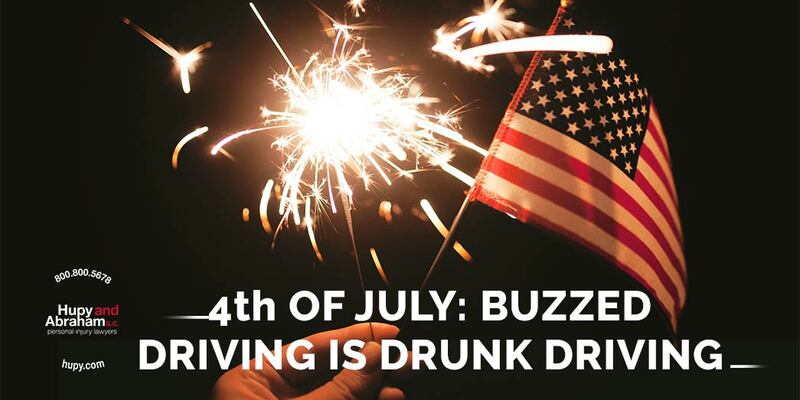 Drunk Drivers Make 4th of July Deadliest Holiday of the Year | Hupy and Abraham, S.C.
We love to celebrate the Fourth of July with family, friends, food and fireworks. But all too often, the festivities can turn tragic on the road. The fact is, Independence Day is one of the deadliest holidays of the year due to drunk-driving crashes. Over the Fourth of July holiday period in 2015, 146 people were killed in crashes involving at least one driver or motorcycle operator with a blood alcohol concentration (BAC) of .08 or higher. Additionally, 92 people died in crashes involving at least one driver or motorcycle operator with a BAC of .15 or higher – which is almost twice the legal limit. The Fourth of July is considered a high-travel period and many people and families will be on the road. So as you prepare to drive home from the festivities, keep in mind that even one drink can be one too many. The National Highway Traffic Safety Administration (NHTSA) promotes its “Buzzed Driving is Drunk Driving” campaign during each major holiday to remind drivers that “buzzed driving” is a dangerous example of “social norming.” This happens when our behavior is influenced by misperceptions of how our peers think and act. In this case, social norming refers to those who think that it is acceptable to drive after one or two alcoholic beverages because that is what “most” people do. But not only can small amounts of alcohol be impairing, it can also make you less likely to safely respond to another potentially intoxicated driver’s unsafe actions. All it takes is common sense and a commitment to safety for everyone to have a safe and fun Fourth of July. Our attorneys experienced in representing the victims of drunk-driving accidents recommend these simple, safe alternatives to drinking and driving. Designate a sober driver or plan to use public transportation to get home safely, even if you’ve had one alcoholic beverage. Look out for your friends! If you see a friend who is about to drink and drive, take the keys away and make arrangements to get your friend home safely. Use your community’s sober ride program. In Wisconsin, Hupy and Abraham is a proud, long-time sponsor of Safe Ride. Contact your local law enforcement if you see a drunk driver on the road. Note the driver’s license plate, type of vehicle, your location and which direction the vehicle is headed. All of us at Hupy and Abraham hope you have a safe and fun holiday! But in the event that you or a loved one is injured by a drunk driver, we are here to help. Contact us at 800-800-5678 or start a live chat anytime at Hupy.com.